Some technologies are aimed at developers, some are aimed at fanboy developers, sometimes however technologies are aimed at the bigger picture, how to architect, deliver and operate enterprise systems. SCA and JBI are two such technologies and there seems to be a misunderstanding around them being competing technologies. I've said before that SCA and JBI should work together so this isn't news but I think its worth quickly explaining why the various vendors need to get the politics out of the way and start working together to make SCA and JBI work together. This is a standard sort of SCA view. So what are the good things about SCA? The last is a brilliant part of SCA as unlike the layer diagrams of BPEL/EJB/Fish/Database etc it makes it clear at the operational level what the Service architecture is, it also encourages you to think about the services and your delivery before getting into even the design (let alone the code). So that is what SCA is good at. What about JBI? Well lets first be clear JBI is not for developers its for product companies. JBI is one of the few standards out there (SCA is another) that actually has a business case for its existence. The various scripting JSRs and some of the other fanboy elements out there just have a technical case. This is typical of lots of IT which aims to deliver technical flexibility to the detriment of business flexibility. In reality the call isn't from one code area to another its really between the service engines, i.e. the bit that JBI does. The goal of JBI therefore isn't portability of the code/service its portability of the engines. 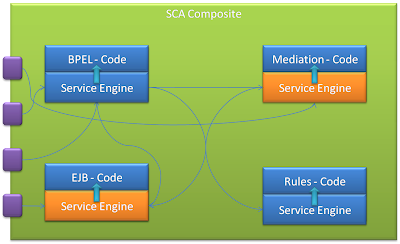 This solves one of the big issues of SCA which is that implementations are limited to a single vendor's platform. It also doesn't really have a great upgrade story so you are again linked to what the vendor wants to do, if the BPEL engine you are happy with is upgraded and the rules engine that you don't like is upgraded and they all run on the same platform which is upgraded then you have to move everything at once, which is a bit of a pain. So the real vision here is for SCA and JBI to work together, unfortunately at the moment the JBI group is missing Oracle, IBM and SAP which makes it unlikely that this will be done. This is to the detriment of customers as it means that SCA will remain a great single vendor platform but will not have the portability and operational flexibility that JBI could deliver. Politics appears to be getting in the way of an SCA/JBI match up as no-one I've spoken to on either side of the divide thinks it isn't technically a good idea. Peter has told me that Sun could basically consider SCA if there was clear user demand. I'm doing my best to drum up such demand, feel free to post your support, l will make sure to be forwarding them to him. I enjoyed the article, great stuff. One can only hope JBI will can acceptance as a compliment to SCA. I'm a novice but it seems odd to me to take a technology neutral architecture and bind it to a vendor's implementation. The link for "should work together" appears to be broken. It points to http://azur.typepad.com/bpel/2005/12/sca_jbi_and_mor.html. Is this post still available elsewhere? The talk is ultimately interesting, and yet open wide discussion areas from a verity of role players in this arena. As known to all and especially in the Cloud Computing landscape, that cloud users differ in their perspective role types and domains, thus for a business process management, terms like goal, tactics, intents are high level aspects of a business motivation model (OMG - BMM), moving towards agility retains these elements and their behaviors to business process owner, process designer, business rule authose, policy author,.. and so on. These parties could be defined at two realms design and run-time, their sort of requirements differ from one another as from SOA viewpoint when each of them is a service provider who are the service consumers and vice versa, the interaction model in SOA architectures including SOA applications is yet still a good material of research. JBI is made by Sun to support technology integration for different "models" and their "implementations" under one container based on Java JSR's standards. JBI is quite interoperable and yet it also prevails high level of integrity between different aspects (AOP Plugin's), thus it provides a good conceptualization of SOA main concepts like separation of aspects and loose coupling. But to also remember that this support is totally subjected to "business" landscape not for programming paradigm. Forfeited programmer's concerns like code portability, code mediation are still beyond the reach even when Model Driven Development tools like UML tried to narrow this gap. SCA architecture came like a savior in this long episode. 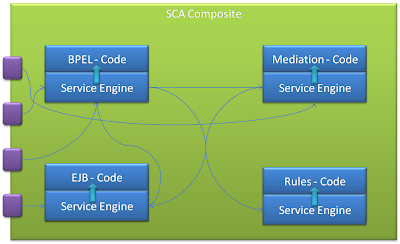 SCA bridges the gap between development and business (including BPM) paradigms, thus by giving a good understanding to SOA concepts represented by service composites and components. Many engines over SCA model are made to support runtime behavior through many implementation types to support traditional languages like c++, cobol and new like Jruby and JPython. The most interesting one is the link to business through BPEL model. Recently Petals ( a JBI container) supported linking to SCA container as Service Engine. 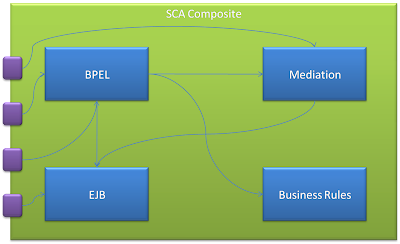 So a semi concrete relationship now between EJB container through Session Beans(Application), SCA composites and components, BPEL model are all in one depot of JBI container.